The source of Lord Sauron's dark power, the Ring, has been retrieved by hobbit Bilbo Baggins after it has been in the hands of Gollum for half a millennium. It poisoned Gollum and it will poison Baggins if he does not give it up, even if it does gift him longevity. A coalition including four hobbits and Gandalf set out to destroy the Ring in the only way possible, by casting it into the volcano from which it was forged. But one does not simply walk into Mordor. 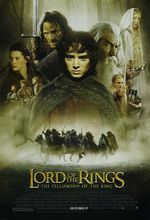 Masterful adaptation of the first book of the heretofore unfilmable Lord of the Rings trilogy.